The fight for Mosul, Islamic State’s capital in Iraq, is taking a heavy toll on the city’s civilian population. RT recounts the horrifying stories of some of the victims. While the US-led coalition claims it does everything possible to avoid “collateral damage” when conducting airstrikes on Islamic State (IS, formerly ISIS/ISIL), in reality, civilians wounded in their attacks are suffering just the same as those hurt by the shells and snipers of the jihadists. Here are some of the stories that victims told RT’s sister video agency, Ruptly, about the siege in Mosul. Five-year-old Hawraa was severely injured on March 16, when an airstrike destroyed her family’s home in the Jadeda neighborhood, said her father Ala, who believes the bombs were intended for IS fighters manning a shooting position in a house nearby. “There were four people in the house, only she survived,” he said. Hawraa’s mother was among those killed in the coalition airstrike. When airstrikes destroyed several houses on Tal Alruman street on March 11, as many as 25 people were left trapped under the debris, and their neighbors and relatives were unable to get them out, Fath Ahmad Abdulla, whose brother was among the victims, told Ruptly. “ISIS was fighting here, behind the house. They tried to run behind the school. Then the house was bombed by aircraft,” he explained. Another resident, Abdulhamed Mahmud, said more than 100 houses had been hit by airstrikes in the neighborhood since the siege began. Ibrahim Rfaee was burying his grandmother Khalas when Ruptly interviewed him on March 12. Khalas was killed by a stray bullet while fleeing Mosul’s Tal Alruman district, which has been subjected to what he called “random bombing” by the coalition. 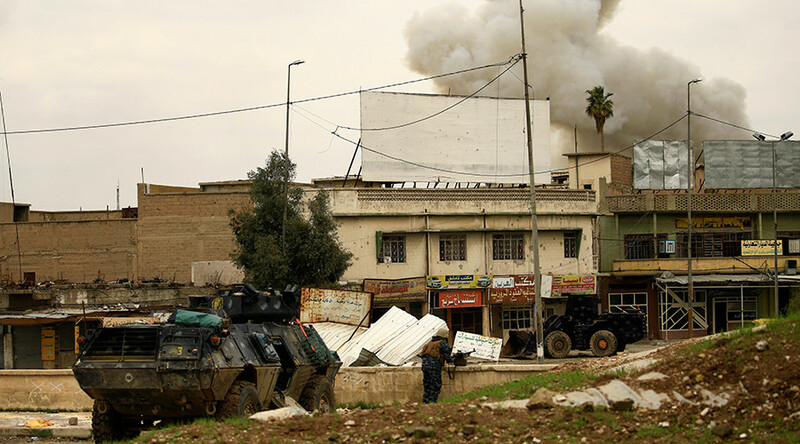 “Daesh go on the rooftops of the houses and the families don’t know. Then the aircrafts come and bomb it,” he explained, referring to the terrorist group by its Arabic acronym. “We are asking the coalition planes to be specific when they bomb. They were bombing randomly,” he stressed. On March 7, Ruptly interviewed several patients at West Erbil Emergency Hospital in Iraqi Kurdistan, who were being treated for injuries received during the Mosul siege. “When the army entered our neighborhood, they started fighting with ISIS, and we were in the middle, on the receiving end of both sides,” one Mosul resident said. There are an estimated 600,000 civilians caught in the crossfire of the Mosul operation, with tens of thousands fleeing the violence over the past month. The number of civilian deaths is difficult to estimate, and it is even harder to attribute them to either IS attacks or US-coalition airstrikes. The US has given a conservative figure of 200 for civilian deaths inflicted by coalition airstrikes in Mosul, but a UK-based monitoring group, Airwars, says the true number may be more than ten times higher.